Superstorm Sandy is what most people will remember from the 2012 Atlantic hurricane season. But Sandy was just one of 10 hurricanes this year — a hurricane season that was both busy and strange. Late summer is when the hurricane season usually gets busy. But Greg Jenkins, a professor of atmospheric science at Howard University, says this year was different. "We saw storms in May and June, and in July and then August, September and October," he says. Jenkins says many of those storms didn't get much attention, though, because of where they went. "Most of the tracks were out over the central Atlantic." But there were a lot: 19 named storms. Most years have a dozen. And a lot of things about the season were just odd. Jenkins says early on, scientists were expecting a quieter year. "We were all thinking that an El Nino would develop in the Eastern Pacific," he says. "And typically when we see that, it's not conducive to hurricanes. But the El Nino never developed." El Nino conditions occur when the Eastern Pacific gets unusually warm. That changes winds flowing to the Atlantic in a way that discourages tropical storms and hurricanes. And without El Nino, two tropical storms actually formed before the season's official start on June 1. Later, a storm named Nadine meandered around the North Atlantic for weeks, reaching hurricane strength three times and striking the Azores twice. Jenkins says Nadine seemed to ignore conditions that usually kill hurricanes — things like vertical wind shear. That's when high altitude winds blow at a different speed, or in a different direction, than low altitude winds. "Nadine was under shear — the waters were cold," he says. "So there was really no reason for it to hang around forever. But it did." And then there was Isaac, which seemed destined to strike the Republican National Convention in Tampa, Fla. It didn't. Instead, Isaac turned toward New Orleans, where it looked like it was going to arrive on Aug. 29 — seven years to the day after Hurricane Katrina. President Obama even took to the airwaves to alert people along the Gulf Coast: "Now is not the time to tempt fate," he said. "Now is not the time to dismiss official warnings. You need to take this seriously." But Jenkins says Hurricane Isaac continued to defy expectations. "As it moved off towards the west, it moved towards New Orleans. And then it just stopped — that was pretty bizarre. We were all thinking it was going inland. It kind of hung out around the coast, dumped a lot of rain" — more than a foot in some places. 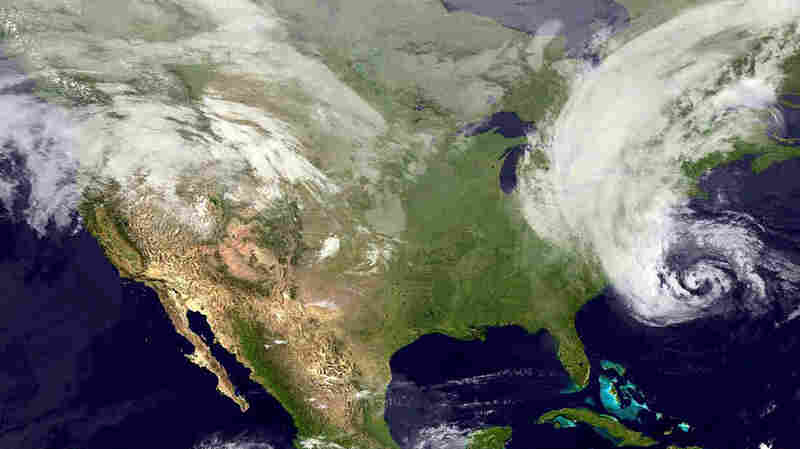 And that brings us to the largest and strangest storm of the year: Hurricane Sandy. Almost everything about Sandy was unusual. It turned left where most storms turned right. It started out as a hurricane and then became an equally powerful winter superstorm. It brought heavy snow to the Appalachians. Jenkins says even veteran hurricane scientists were amazed. "If you're looking at it from a weather or research point of view — it's just like, 'Wow. Really?' "
Because Hurricane Sandy was expected to become a winter storm, the National Hurricane Center handed off warning duties to another branch of the National Weather Service before landfall. Officials are still discussing whether that confused the public. But Jenkins says it was clear that Sandy was going to be a major threat. "The wind field was so large and the winds were powerful. And it began impacting the East Coast days before it actually arrived." "The area that we're most concerned about is Raritan Bay, Long Island Sound, where we could see anywhere from 6 to 11 feet of inundation above the ground. That means if you're 6 feet tall, the water could be 5 feet above you," Franklin said. The storm surge exceeded even that forecast, reaching 13 feet in parts of lower Manhattan. Meteorologists say they don't know why there were so many storms this year. It's not clear, for example, whether global warming was a factor. But they note that since 1995, 70 percent of hurricane seasons have been busier than normal.